I’m not entirely sure of how to rate Trouble Comes in Threes as there were parts of the story I loved and parts that had me rolling my eyes in frustration. To be honest, I’m not going to go into much detail or discussion about the things that had me rolling my eyes because I suspect that for the most part, they were personal annoyances and I don’t want to negatively affect someone else’s opinion regarding the book, nor do I want to risk spoiling the book because there’s a romantic suspense thread that plays out that I wasn’t expecting based on the blurb – which was actually one of the things that increased my enjoyment of the book. I found the relationship dynamic that develops between the two mated cat shifters, Dolf and Tal, and their human mate, Kirk, to be quite fascinating. In light of the anti-human prejudice that seems to pervade the cat clowders, it would seem that Dolf and Tal’s acceptance of Kirk as their mate occurred too easily. However, when Dolf explains the mating scent and how he responded to it upon meeting Tal (and vice versa for Tal), it was relatively easy to understand the need that compelled the shifters to follow their human mate so that they could learn more about him, and later defended their right to claim their mate to a less than receptive collection of clowder members. As I said, the actual relationship dynamic between the trio was fascinating in how it balanced out each partners’ needs – a balance which we learn had not been fully achieved when it was just Tal and Dolf, even if they didn’t fully realize it until Kirk’s arrival. Kirk truly was a wonderful blend of dominance and submissiveness, knowing when to hold his ground and when to back down. While I did think that Kirk’s acceptance of Tal and Dolf’s shifter nature progressed far quicker than I would have expected, I thought that in the end, it played out well. The narrator, Ronald Ray Strickland, have a lovely voice and did a nice job in his storytelling. I will admit that I relied upon the point of view prompt at the beginning of each chapter quite a bit so as not to get confused as to which of the three men were narrating at that point. There were a few occasions when Strickland’s subtle voice changes for the different characters was a tad too subtle, leaving me confused as to who was talking a few times during the listen. As an aside, I did find that twice during my listening of the audiobook that there was an issue with the recording; however, neither occurrence affected my overall rating because they were easily rectified. Although not my favorite of Church’s books, I did enjoy the audiobook edition of Trouble Comes in Threes and am looking forward to listening to the next book in the series soon. 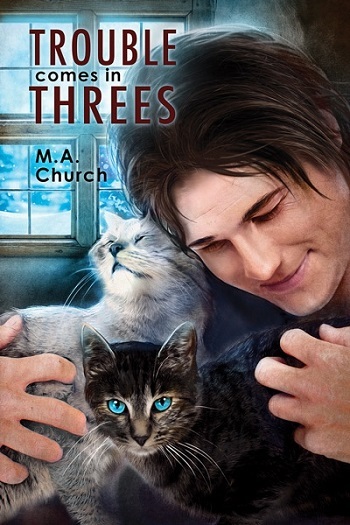 Reviewers on the Wicked Reads Review Team were provided a free copy of Trouble Comes in Threes (Fur, Fangs, and Felines #1) by M.A. Church, Narrated by Ronald Ray Strickland to listen to and review.